If you’re visiting Guaranteed Rate Field for the first time to see the White Sox, there are a few things that you should definitely be aware of in this ballpark. It may not present the same challenges as Wrigley, but to some, that’s what makes Guaranteed Rate Field a fun place. Here are some tips you should know for your first trip. Hmmm…which window has that “generous” guy? 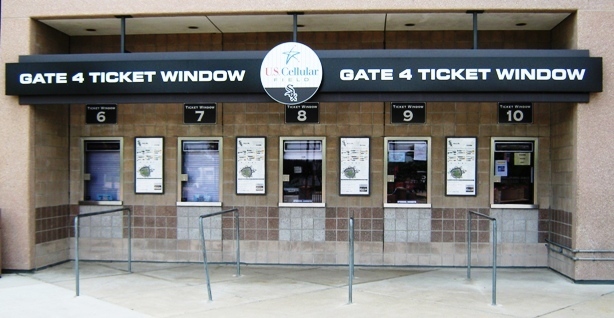 Visiting Guaranteed Rate Field Tip #1: Get tickets from the box office. That is, unless you can find a crazy great deal from a third party seller; but the White Sox don’t sell out most games and they don’t charge fees at the box office. You can save quite a few bucks this way, especially buying multiple tickets. The only exceptions to this rule are Cubs games and perhaps Yankees and Red Sox games on July/August weekends. You didn’t check your E-Guide? 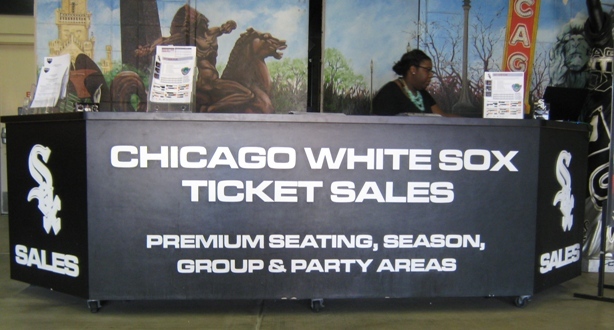 Visiting Guaranteed Rate Field Tip #2: Avoid the upper (500) level seats! Yes, they’re cheap and yes they offer a nice panoramic view. 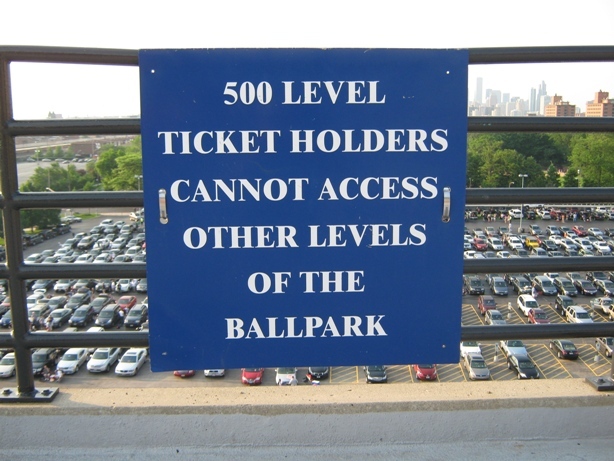 They’re also restricted; fans with upper level tickets are not allowed to access other levels of the ballpark. This can be a real downer for a traveling fan who likes to walk around an entire ballpark to see what food offerings and statues are there, and that’s most of us. 500 level seats are for people looking for a White Sox game on the cheap, not first time visitors. If you want to go cheap, go for the outfield corners. 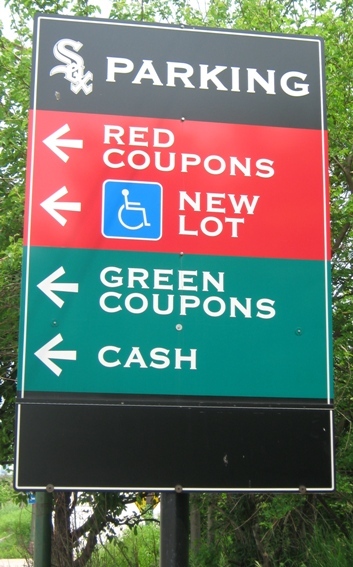 Nothing but old lots that don’t take coupons to the right. Visiting Guaranteed Rate Field Tip #3: Drive only on Sundays. The CTA Red and Green Lines both serve Guaranteed Rate Field well, as does Metra Rail. All three have stations close enough to the ballpark that it’s in view from the station platform. You can drive to the game if you want to be a part of a tailgating scene that is certainly respectable, but it’s a fairly high parking cost. Parking is much cheaper on Sundays, though, so save the brats and grill for the Sunday afternoon games and use CTA or Metra (or the Pace Express!) for the rest of them. Chicago dogs in Chicago. When common sense just works. Visiting Guaranteed Rate Field Tip #4: Have a Comiskey Dog. Or Burger. The Comiskey dogs are the Chicago-style dogs at the ballpark; it’s a dog the way it’s meant to be in Chicago, with yellow mustard, chopped onions, neon green relish, pickle spear, tomato chunks, sport peppers and celery salt. Or get the Comiskey Burger…with cheddar cheese, pico de gallo and other Chicago Dog ingredients. There’s other great food here like Bobak’s sausages and elotes, but the Comiskey dogs and burgers are the true taste of Chicago. The short porch will jack up your kid’s power numbers. Visiting Guaranteed Rate Field Tip #5: Bring the kids. Guaranteed Rate has one thing on its neighbor in Wrigleyville; it’s much more kid-friendly. 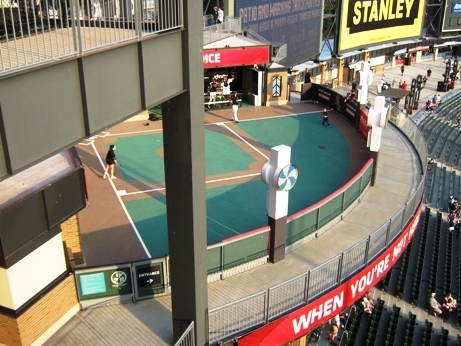 Not only is it a whole lot cheaper to bring the little ones to a game, there’s a terrific Xfinity Kids Zone in left field, with interactive games and a wiffle ball field on the upper level. And not to be derisive of the smaller crowds the Sox are drawing, but it is a bit less worrisome with little ones to not be in a concourse jammed with people as Wrigley so frequently is. Wait until the kids are a little older for the Friendly Confines…for now take them to a game on the South Side. There you go…some first time tips for visiting Guaranteed Rate Field. There’s a whole lot more to know of course, but this should help you get started.